Datums are imaginary geometric shapes, such as a point, line, plane, circle, or cylinder. A datum feature is a physical feature of the workpiece or part that acts as a physical analog to the datum and is a point of reference or a point where measurements are made. Deflection is unintended bending of a tool, workpiece, or machine component. It leads to inaccuracy or perhaps worse if it causes damage to the tool, workpiece, or machine. Rigidity is the counter to deflection. 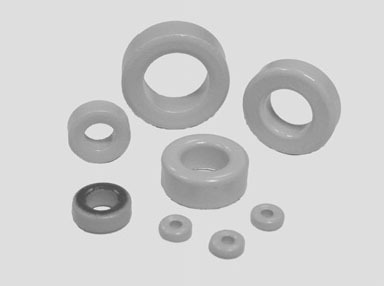 Delrin is a trade name for Acetal. See also Acetal. It can be a pretty good material to make light duty leadscrew nuts from because the plastic will tend to expand and thereby eliminate backlash. This is the torque you feel when you twist a stepper motor that has no power applied to it. The detent torque can cause a stepper motor to try to hold its position even when power is switched off, at least to the nearest step. With no power, the microstep position will be lost. Digital Differential Analyer, abbreviated "DDA" referred to a mathematical technique or algorithm used to interpolate paths for motion control, computer graphics, and other applications. In CNC applications, interpolation is necessary because the axes of the machine move strictly at right angles to one another. Any motion not precisely aligned with the axis is always an approximation of a true smooth motion. The approximation is done by moving more than one axis at a time, by a relationship calculated by the DDA algorithm. It operates by doing repeated addition of 2 values (dx and dy) to the x and y position of the last point to derive the next point on the line. Some servo and motion control systems allow the user to examine the DDA values for debugging purposes. A mechanism for mapping the 3D surface of a real object and producing a computer model suitable for a CAD/CAM program from the model. Digitizing can be accomplished using a Tool Probe (See Also Tool Probe) or Laser Scanner to name just two relevant technologies. DIN 66025 is the European standard for the G-Code language. See Also G-Code. Distributed Numeric Control is a protocol, similar to a local area network, used to link together CNC machines on the shop floor. Before DNC, it was necessary to deliver part programs to the machine using other means—originally paper tape, later floppy disks or bubble memory, and lately using USB keys. Depth of cut is a measurement of how much material the cutter is removing along one axis. So, a ½” endmill whose end is 0.020” into the surface of the material being cut, either below the face in the Z-direction or along the sides of a slot or pocket in the X or Y directions, has a 0.020” depth of cut. Obviously it takes more power to run a higher depth of cut. You may need to run at a slower feed rate or spindle speed if you run a greater depth of cut. For CNC machines, it can be more advantageous to reduce the depth of cut, increase spindle and feed rates, and just make more passes to reach the desired depth. Depth of cut is typically less than the diameter of the cutter, and sometimes much less depending on the rigidity of the machine and cutter. Dongles, also called USB Keys, are electronic keys that are used to copy protect software such as CAD or CAM software. The software will not operate unless the dongle is in place on the machine trying to run the software. - Dovetail Ways: Very common on mills, dovetail ways look like the dovetails used in wood joinery. 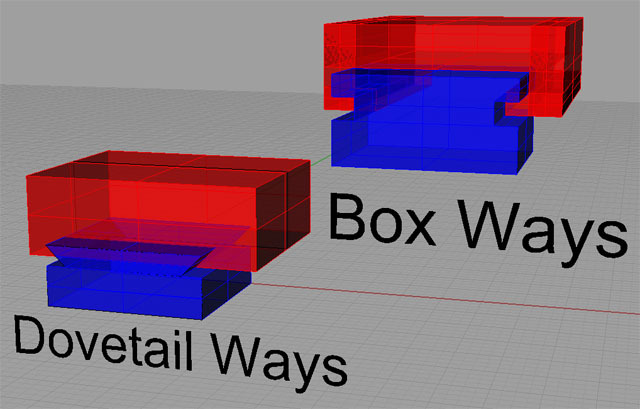 - Box Ways: Box Ways are rectangular cross section, as opposed to the angular shape of dovetail ways. Box ways are very strong, but they suffer from two shortcomings. First, they involve a lot of surface contact area, so managing friction is key. Second, in order to slide at all, some clearance is required, which results in some slop in their travel. They are the strongest and most rigid design, but they are difficult and expensive to manufacture. - Prismatic Ways: These are prism shaped ways common to lathes. - Linear Ways: Linear ways use linear slides as rails and so are much different than the other three styles. The roll on ball bearings as opposed to having more metal-to-metal contact in the other designs. Linear ways will have the least rigidity, but for the price, they are ideal for precision and high speeds. Box Ways vs Dovetail Ways..
Drawbars are used to pull collets and toolholders into their tapers. See Also Taper. They may be threaded into the collet, or they may grip the toolholder’s Retention Stud. A drill bushing is a hardened steel cyclider with a hole in it the diameter of the drill bit. They're designed to support the end of the bit to increase the precision when drilling. Drill bushings may be inserted into a jig. They are also frequently used when there is a need for a precise hole of a particular diameter that may need to be replaced from time to time when worn. Drill drift is the tendency for a twist drill to wander when just getting started, or to wander due to conditions in the hole. To reduce drill drift and ensure a more precise hole, use a spot drill before drilling the hole and/or use a drill bushing. See also "Drill Bushing" and "Spot Drill". Drip feeding is a technique of feeding the part program to the CNC machine a little bit at a time if the whole program is too large to fit into memory at once. An electronic circuit used to control the current sent from the power supply to a motor and thereby control what the motor does. A Gecko drive is one example of a driver. A Digital Read Out or DRO provides a digital indication of the position of one or more axes on the machine. DRO’s typically use linear scales (See Also Linear Scales) to measure the position, but other technologies have been used as well. In Mach3, a DRO is a numerical indicator within the program that has a number of different capabilities and properties. Dry machining is the process of machining without coolant. Often a strong stream of compressed air is used to cool chips. Dry machining can often increase productivity and reduce chip breakage at very high SFM rates. It is also used in some cases because it is less messy or healthier for the machinists. On the other hand, unless properly applied, it can seriously reduce the life of your tooling. Be sure to check carefully with your tooling supplier about dry machining parameters. Refers to using two angular contact bearings (See Also Angular Contact Bearing) in pairs. The bearings are usually a matched pair and should not be separated. They’re matched by being ground to match one another, and when used in proper combination, this provides a preload (See Also Preload). An intentional delay to keep a rotating tool in contact with a part, perhaps to improve finish. G04 is the G-Code command to force a dwell between operations. Also, any point in a toolpath where the cutter stops, perhaps just prior to changing direction or before retracting. A dwell can often introduce visible marks in the workpiece which are called "Dwell Marks". Because of these marks, dwells may be undesirable form a surface finish standpoint. An AutoCad CAD file format. DXF is the Autodesk file format and file extension for Autodesk CAD drawings. It’s also a common format that most CAD and CNC-related programs can read and write. 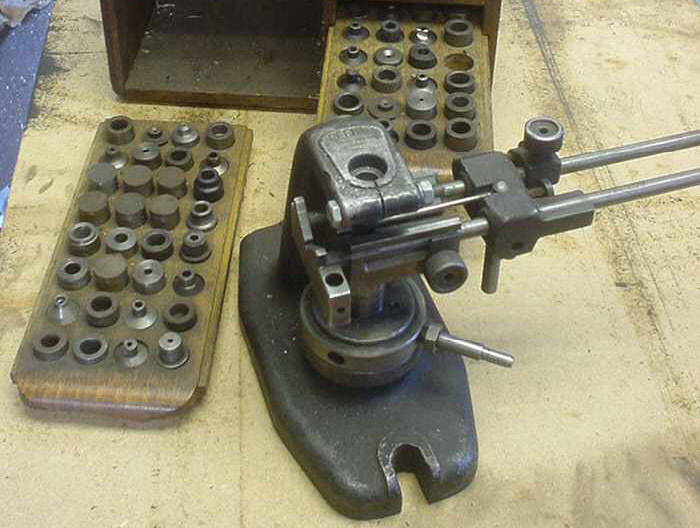 A device used to find the exact edge of the workpiece along the x or y axis. Edge finders can rely on electrical contact, a sensitive pressure switch, or be strictly mechanical. An encoder is an electro-mechanical device used to measure shaft rotation. Often they are optical in nature. They’re used to provide feedback in closed loop control systems. 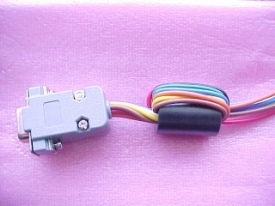 Encoders are often associated with servos. - Number of flutes. Endmills may be had in a variety of configurations including 2, 3, 4, or more flutes. - Roughing or Finish Style: Roughing endmills are good for hogging out material, but not so great for finishing. - Centercutting: Determines whether the endmills center cuts. If not, the mill cannot be used to plunge cut. See Also Centercutting. - Material: Endmills are made from a variety of materials ranging from High Speed Steel to Solid Carbide. - Coating: There are a variety of coatings designed to improve the performance of the endmill. - Type: Standard, ball nose, double ended, etc. - Length: Shorter endmills are more rigid (See also Rigidity), longer endmills may be needed to reach. There are many other characteristics that define an endmill. Hanita offers a lot of information about endmills on their tech data page. The control that stops all machine operation. Usually it physically interrupts all power to the spindle and axis drive motors. Once an e-stop has been triggered, a special operation is normally required to resume power. G-Code G09 performs an Exact Stop Check. The Exact Stop Check command is similar to Exact Stop Mode (See Also Exact Stop Mode), except that it only takes effect on the next change of direction and then is cancelled, so it only works once, rather than continuously like the mode. Triggered by G61, and cancelled with G64 (see Constant Velocity Mode), Exact Stop mode causes the machine to bring the axes to a full stop between each motion command. This can result in less rounded outside corners. The downside is that if the tool comes to a full stop it will have a tendency to leave witness marks on the workpiece there. Face milling is the act of milling a surface perpendicular to the axis of rotation of the cutter. A face mill is a cutter specifically designed for this purpose. A part program word that determines feed during program execution. The act of moving the workpiece relative to the cutter. Either or both can move. See also Feedrate. A CNC machine panel control that stops the machine from executing further commands. A control on the panel that allows the operator to manually increase or decrease the federate. This allows the operator to fine tune the program without the need to rewrite any g-codes. Feedrate override is a percentage of the programmed value. In control systems, a feedback loop is one where a sensor provides feedback to help control a motor or other device. In CNC, closed loop (See Also Closed Loop) systems incorporate feedback to increase accuracy and performance. The rate at which the cutting tool and workpiece move in relation to one another. Faster feed rates can remove material more quickly, but may require more power or may wear out the cutter sooner. In part programs, the feedrate is established by F-Words. See Also F-Words. Refers to the feedrate and spindle speed that should be used for an operation or that a machine is capable of using. Machinery’s Handbook has comprehensive information on what the best feeds and speeds are. Jonathan Saada has an online Feeds and Speeds calculator here. 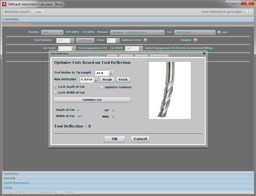 Machinist Mate is a popular software utility for calculating feeds and speeds. Ferrite beads are used to reduce noise in electrical systems. Pop a bead onto each power line--AC to power supplies, DC to each motor driver, +5V logic supply, etc. The beads eat the noise by resisting the flow of high frequencies onto the line. Because they cut out high frequency noise, they're ideal for AC and DC power lines, which are operating at no frequency (DC) or low 60 Hz frequency (most AC). Another name for Exact Stop Mode. G61 sets Exact Stop Mode. Another way to view this mode is at the end of each move, the controller checks how far from the expected position it is and compares it to a coarse or fine boundary. G64 (Constant Velocity) uses a coarse boundary while G61 (Exact Stop) uses a fine boundary. See also Constant Velocity and Exact Stop. A final pass with very shallow depth of cut (See Also DOC) that provides higher accuracy and better surface finish than a roughing cut. Using a very high volume of coolant (See Also Coolant) to ensure good chip evacuation and cooling. Use of flood coolant requires a reservoir, pump, delivery piping, and some form of enclosure so that the coolant doesn’t spray everywhere. The term “flute” refers to a cutting surface. A 4-flute endmill (See Also Endmill) has 4 cutting surfaces. A type of cutter that is a single point cutter (See Also Single Point Cutter) meaning there is only one cutting edge. Flycutters are commonly used in milling operations. The can produce a good surface finish over a broad area. They make a characteristic thumping noise due to the fact that they are basically taking an interrupted cut. Fly cutters come in many varieties ranging from specialized cutters (perhaps used to make a gear) to more general versions that use lathe tools. In a closed loop system (See Also Closed Loop), following error is the difference between where the axis is based on feedback (See Also Feedback) from an encoder (See Also Encoder) or other device, and where it should be, based on what the CNC control program has commanded. Closed loop systems will have a maximum following error that they will permit, beyond which they fault the servo and stop the machining process. So long as the following error does not exceed the maximum, the axis may eventually catch up again and eliminate the error. Given real world limitations, it isn’t practical to insist on 0 following error at all times. In follow turning two tools and two independent tool turrets are used on a CNC lathe to speed cutting. Each tool cuts at the desired depth of cut, with the second tool starting its cut where the first left off. In this way, twice as much material can be removed per pass.